Nearly 15 million people are now registered to vote in Texas, a state record. Texas currently has more than 14.8 million voters registered — over 1 million more than were registered in the 2012 presidential election, according to the Texas secretary of state’s office. Keith Ingram, director of elections for the secretary of state, told the House Elections Committee on Wednesday that about 14.3 million voters were registered in time for the March primaries. The increase could be attributed to higher voter interest in a presidential election year, as well as a growing Texas population, according to Alicia Pierce, spokeswoman for the Texas secretary of state. “We can definitely see there’s historical trends that presidential elections tend to attract more attention,” Pierce said. So to put this another way, the increase from 2012 to 2016 is almost as big – and in the end, may be at least as big – as the increase from 2000 to 2012. At 15 million registrations, if turnout of registered voters is the same as it was in 2012 (58.58%), total turnout would be nearly 8.8 million, or some 800,000 more than what we had in 2012. One possible reason for the polls being what they are is a belief that all of this will lead to a surge in Democratic numbers. For example, a result of 4.6 million for Trump, 3.9 million for Clinton, and 300,000 for the others would be an eight-point Trump win (52.3% to 44.3%), certainly in line with polling. We’re deep into speculation here, and of course the polling numbers may change, so don’t take any of this seriously. We’ll begin to get some idea when early voting begins. In the meantime, let’s just call this further evidence that this is a different election. I’m always happy to see people take an interest in their government, but I’d like to compare those numbers with the numbers of (legal, eligible) adults in Texas. Got any info like that, Kuff? Census numbers aren’t terribly helpful since they don’t differentiate between legal and illegal residents, and the census isn’t conducted often enough. I suspect most of the increase is in cities rather than rural areas. Also, I have a feeling that a large amount are newly naturalized citizens…. I certainly hope that’s true. People who went through the trouble of coming here legally ought to be supporting Trump in large numbers. Of course, those who were here illegally and got legal because they married a citizen or some other method will probably be voting Hillary. Supporting illegal immigration is a slap in the face to every immigrant that went to the time, hassle, and expense to come here legally. Gotta love the damn conspiracy theory. These people can’t possibly be legal and eligible to vote! You misunderstood my question. I’m saying there are probably a lot more people who, while eligible to vote, are not registered here in Texas. I want to know how many people are of age and eligible (i.e. not felons and US citizens) there are here so we can determine what percentage of eligible adults in Texas are actually registered. While I wouldn’t be surprised if I learned illegal aliens were voting, I really doubt any number that would be found (if any) would be statistically significant. Take up your beef about phantom illegal aliens voting with the Republican Secretary of State. Hasn’t that position been held by the GOP for more than a quarter century? “Wouldn’t be surprised if I learned” doesn’t equal a “beef” about phantom illegals voting. I’ve already stated that if there are any, the number would be statistically insignificant. but way to ignore the real question asked, which is, what percentage of eligible adults in Texas are ACTUALLY registered to vote here? Actually, it seems like a kind of non-partisan question to ask, really. No need to bring in red herrings. 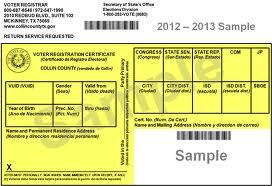 “what percentage of eligible adults in Texas are ACTUALLY registered to vote here? it *is* a nonpartisan question to ask, bill. the problem is that it took you four tries to actually ask it, and each preceding effort involved the invocation of words like “illegals” and “supporting Trump in large numbers.” once someone has to wade through all that to get to your question, it isn’t surprising that along the way they become aware of your partisan angle. that, or maybe people have read your stuff before. Bill, try searching “Texas citizen voting age population”. There are some items that come up. I didn’t open them but there might be something you could use. Question asked, and I gave two reasons why census data wouldn’t be helpful. Neither one of those are leading, partisan reasons, they are just facts. Tom inferred a conspiracy that I can only reason as, there are more registered voters than there are eligible voters, thus some fraud going on. That’s absurd on its face, since not more than half of registered voters actually vote anyway. Thanks, I’ll do some sleuthing in my spare time. All of this talk about registration fraud is just voter intimidation–a way to suppress the minority vote. It’s Selma, Alabama all over again but in a slightly more subtle form. There’s no reasoning with Catherine Engelbrecht and her followers. They see brown and black people as a threat to their power and will stop at nothing to keep them from voting. Bill your way of stating things sure makes one think you are a racist, but maybe you are not. Why limit it to legals and illegals. Someone not 18 can’t vote, why not mention that? Someone that does not have the mental capacity can’t vote, why not mention that? There is a lot of focus on legal and illegal from your end all of the time. Don’t like “illegals” vote Democrat, the Republicans are the ones that want them here illegally. Ready for a little irony? Remember the recent mall shooter, the Muslim who legally immigrated from Turkey? Guess what? In addition to gunning down Americans, that green card holding legal resident voted in his spare time….also illegally. Yep, I’m a racist. I also eat small children and kick puppies. Well I am glad that you admitted being a racist, although I doubt that you eat small children, not sure about puppies. But Bill do you read what you post? The link states that the guy you reference was a citizen. Maybe you do read, but you are so anxious to believe that somehow you are not a racist that you post articles that prove that you are a racist. Bet you will vote for Trump another racist. Read again. The guy was a legal resident, with a green card, which means he is (well was) NOT a citizen. Didn’t stop him from voting, though. And yes, this “deplorable” is voting for Trump, my first presidential vote for a (R), ever. Since you have redefined wanting to enforce immigration law as the hallmark of racism, I certainly meet that requirement. Until this year, until Trump, neither the (R)’s or the (D)’s cared a whit about the invading army of illegals. Probably there isn’t much of a problem in that area in Chappaqua, Martha’s Vineyard, or Kennebunkport, so hey, why not? Bill I agree with you that you are a racist and even stated that your article proves it. Read the darn thing, they sometimes get up dated. But racists don’t want to believe what they don’t agree with they live in their own reality. UPDATE: KING 5 learned Thursday that Arcan Cetin, the 20-year-old who killed five people at Cascade Mall on Sept. 23, is in fact a U.S. citizen. By the way Bill, I voted for Reagan, never voted for Obama. In case you forgot Reagan gave those “illegals” amnesty. There is no army of “illegals”, you are delusional. I stand corrected. The shooter does indeed appear to be a citizen…..today. And I do agree Reagan granted the last amnesty….a mistake, he later admitted. He was sucked in by the promise, “we will just legalize all these people and then we make sure this problem doesn’t happen again by tighter security.” Well, all amnesty did was cause even more people to come here illegally, so they could wait their turn to get amnesty, too. Actually most of them came after NAFTA, which I was against, there were winners and losers in both countries. Mexico’s small farmers could not compete with the subsided large farms, they could not produce enough to sustain themselves, so they did what many Europeans did in the 1800s.